2015 is shaping up to be a landmark year for global action on Climate Change. The future of the Caribbean depends on a binding and ambitious global agreement at COP 21. A bold agreement that curbs greenhouse gas emissions to limit the global rise in temperature to below two Degrees Celsius  is needed to safeguard our food, critical industries such as tourism, infrastructure and promote renewable energy. The live-stream of the Caribbean Climate Change Exchange will begin at 8pm (-6 GMT). Bookmark this page to watch the proceedings live and learn what this means for the Caribbean. You may download the agenda here. 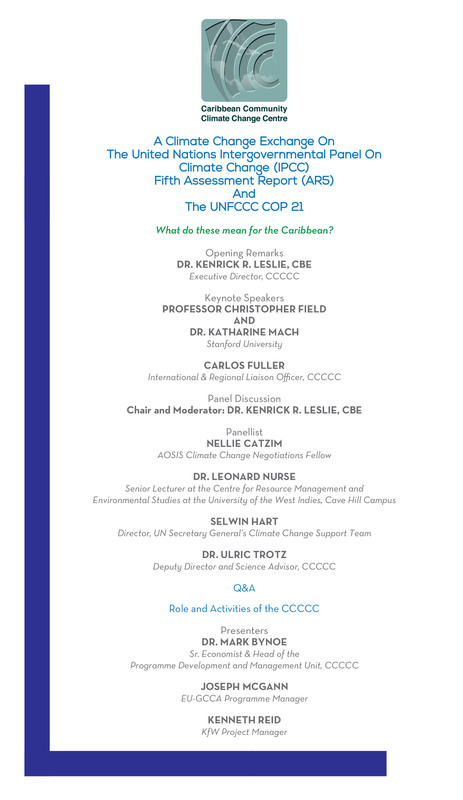 An impressive set of international, regional and national experts are slated to speak this evening, including Professor Christopher Fields and Dr Katherine Mach of Stanford University, Mr Carlos Fuller, a veteran Caribbean negotiator, Dr Leonard Nurse, a member of the IPCC’s research and thor teams for four global assessment reports and three key project managers. Peruse the Speakers’ Guide to learn more. Why is COP 21 important? As this evening’s event gets underway, many are wondering “Why is COP 21 Important?,” especially for the Caribbean. In summary, 2015 is shaping up to be a landmark year for global action on Climate Change. The future of the Caribbean depends on a binding and ambitious global agreement at COP 21. A bold agreement that curbs greenhouse gas emissions to limit the global rise in temperature to below two Degrees Celsius is needed to safeguard our food, critical industries such as tourism, infrastructure and promote renewable energy. Perused our informational card “Why is COP 21 Important?”for more context and the region’s 11 point negotiating position leading up to COP 21. We trust you have been following via our live-stream this evening. We're wrapping up shortly. Feel free to comment below for clarifications where necessary. By caribbeanclimate in News on July 30, 2015 .